We’d love your help. Let us know what’s wrong with this preview of The Pattern on the Stone by W. Daniel Hillis. Most people are baffled by how computers work and assume that they will never understand them. What they don't realize—and what Daniel Hillis's short book brilliantly demonstrates—is that computers' seemingly complex operations can be broken down into a few simple parts that perform the same simple procedures over and over again. Computer wizard Hillis offers an easy-to-fol Most people are baffled by how computers work and assume that they will never understand them. What they don't realize—and what Daniel Hillis's short book brilliantly demonstrates—is that computers' seemingly complex operations can be broken down into a few simple parts that perform the same simple procedures over and over again. Computer wizard Hillis offers an easy-to-follow explanation of how data is processed that makes the operations of a computer seem as straightforward as those of a bicycle. Avoiding technobabble or discussions of advanced hardware, the lucid explanations and colorful anecdotes in The Pattern on the Stone go straight to the heart of what computers really do. Hillis proceeds from an outline of basic logic to clear descriptions of programming languages, algorithms, and memory. He then takes readers in simple steps up to the most exciting developments in computing today—quantum computing, parallel computing, neural networks, and self-organizing systems. To ask other readers questions about The Pattern on the Stone, please sign up. Is there an update to this book available/published...??? With regard to latest developments, such as cognitive computing, hybrid thinking, exponential technologies, AI and Big Data and complex/predictive analytics..? دوم- یکی از فصل های خواندنی، فصل چهارم بود با عنوان «ماشین های تورینگ تا چه حد جهان شمول اند؟» . در این فصل به این پرسش پرداخته میشود که حد توانایی های کامپیوتر کجاست و ذیل آن به بحث هایی جذاب در باب ماشین های تورینگ، محاسبه پذیری، سیستم های آشوب مند، قضیه ناتمامیت گودل و محاسبه های کوانتومی می پردازد. سوم- یکی از نکات جالبی که نویسنده مطرح میکند نگرانی های انسان ها در باب رشد روزافزون قدرت کامپیوترها ست. نویسنده ریشه ی این نگرانی را در منشا ارزش و شانیت انسان و ترس از به خطر افتادن آن می داند. وی معتقد است همانگونه که روزی بشر معتقد بود زمین مرکز عالم است و انسان یگانه سلطان این مرکز و لذا سلطان همه ی عالم برای همین وقتی سخن از نقض این نظریه در آثار کسانی چون کوپرنیک و دیگران دیده شد، جنجالی به پا شد و یا زمانی که سخن از تکامل انسان ، این به ظاهر تافته ی جدا بافته آمد همه ی دعواها و جار و جنجال ها ریشه در نگرانی از خدشه در منشا ارزش انسان داشت، دعواهای اخیر در باب کامپیوترها هم چیزی از همین جنس است. چهارم – مبحث جذاب دیگر در باب قدرت یادگیری در کامپیوترها و فشل بودن فرآیند طراحی مهندسی و سلسله مراتبی در این امر است که به بحث از ایده ی تکامل طبیعی در ساخت کامیپوترهایی با توانایی یادگیری میرسد و این که در نهایت مورد مطلوب روشی ترکیبی از تکامل، رشد، آموزش و ساختار مهندسی ست. چیزی که در ذهن و ضمیر وذات آدمی هم دیده می شود اینست که توانایی آدمی همان اندازه در ژنوم او نهفته است که در فرهنگ او. پنجم- بسیاری از مباحثی که کتاب پیش بینی میکند امروزه به جریانهای پژوهشی مبدل شده اند و یا حتی به تحقق (عملی) پیوسته اند. مباحثی چون یادگیری ماشین، یادگیری عمیق، اینترنت اشیاء و... که با توجه به تاریخ انتشار کتاب (1998) در حد فرضیه و پیش بینی بوده و امروزه به جریان های اصلی حوزه های مهندسی تبدیل شده اند. On the one hand, I'm not the intended audience. I understand how computers work more than most, that's literally my job to write the software that runs the internet. On the other, I AM the intended audience, because I have zero clue how computers work on a hardware level. On a mutant third hand, I'm not really the intended audience again, because I intimately understand the physics behind all of the individual components....complex impedence, inductance, breakdown voltages, RF circuit resonances, and so on. I'm in a weird place where I write the high level software that makes computers work. I understand the theory behind programming languages, object-oriented design, system design, compilers, parallel processing and multi-threading..... I also understand the physics behind the components and why transistors are able to function as logic switches, how data is stored and read magnetically on a HDD platter or, more recently, SSD chips. What's missing is the middle bit. How does a circuit I know in and out turn into the operating system I'm modifying? I was hoping this book might answer that question. In a sense, it did, but not at a level that left me satisfied. I understand better how memory registers function and how you build blocks of switches that are hard-wired function machines. But I'm still missing the middle bit: How does what's in that data register (the machine code instruction byte(s)) end up at the correct block within the processor? How does the output get routed to the correct destination after it's computed....how does it know one result goes to the USB controller to get sent back to some peripheral device, but another gets sent to another controller to trigger a disk write to save a file? A good preview of what computer science is about. For a person who wants to join the field this may give a hint for paths you can chose from within the domain. 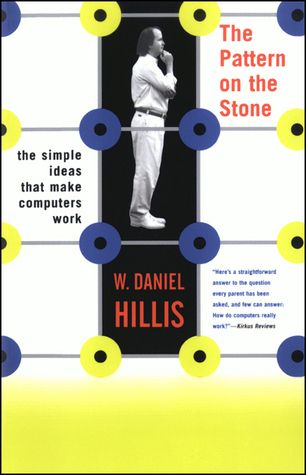 Daniel Hillis conceived of this book to explain the holistic view of the modern day computer, how hardware and software combine to generate the final products that we the users see. In a way he succeeded in explaining the concepts such that any person with minimal background knowledge on computers can understand. My qualms with this book are more because of me rather than the book itself. I had picked this book in the hope that it will somehow explain to me how the logic gates and their operation Daniel Hillis conceived of this book to explain the holistic view of the modern day computer, how hardware and software combine to generate the final products that we the users see. In a way he succeeded in explaining the concepts such that any person with minimal background knowledge on computers can understand. I was very, very impressed by The Pattern on the Stone. Hillis explains, in terms that anyone can understand, how computers work from the most basic principals. A previous familiarity with any or all of the principals will make understanding easier, but is entirely unnecessary. There is no prerequisite to reading this book. I will be completely honest: I don't think there is any one topic in this book that I had not already explored in other reading. However, I've never seen it all described toge I was very, very impressed by The Pattern on the Stone. Hillis explains, in terms that anyone can understand, how computers work from the most basic principals. A previous familiarity with any or all of the principals will make understanding easier, but is entirely unnecessary. There is no prerequisite to reading this book. I will be completely honest: I don't think there is any one topic in this book that I had not already explored in other reading. However, I've never seen it all described together in one seamless narrative before! That's an amazing feat, especially considering the brevity of the book. Computer Science is a huge subject with applications (and implications) that reach far beyond crunching numbers. Hillis describes many mind-expanding topics, such as Turing's hypothesis of universal computing, with wonderful lucidity and clarity. The ability to put together a book like this with just the right amount of information to be clear, but no more, is rare. I'm sure the author's temptation to write much more on each topic was very strong. I honestly believe everyone should read this book. People with no previous knowledge of the computer sciences would benefit enormously. Those of us who're already familiar with some or all of the topics will still, I think, gain insight by seeing the big picture. At the very least, it will surely jog the memory quite thoroughly. Even if all of those reasons fail, it's a quick, thoughtful read. Other interesting note: I thought Daniel Hillis' name seemed familiar. I was delighted to discover he's also the creator of the "Clock of the Long Now", the 10,000 year clock, a project that has long been a fascination of mine. "Holy crap," I thought, "he's that Daniel Hillis!" I wish I had been made to read this as a senior in high school, or as a freshman in college. I highly recommend it to beginning electrical engineering and biomedical engineering students, as well as those interested in broad-based popular science. It provides a great overview of the fields of electrical engineering and even some biomedical engineering, pulling together many of their interdivisional ideas while covering topics like Boolean algebra/logic, feedback control systems, biology, the brai I wish I had been made to read this as a senior in high school, or as a freshman in college. I highly recommend it to beginning electrical engineering and biomedical engineering students, as well as those interested in broad-based popular science. It provides a great overview of the fields of electrical engineering and even some biomedical engineering, pulling together many of their interdivisional ideas while covering topics like Boolean algebra/logic, feedback control systems, biology, the brain, evolution, neural networks, computer science and programming, nature vs. nurture debate, cognitive psychology, imaging/image processing, signals & systems, technology, ethics, philosophy and even history. Though dated, this is a still-relevant high-level basic tour on the architecture of digital computers. It goes through the processor, memory, disk, and how computation is executed through these and other components. One big omission of detail is anything to do with circuit topology and gate-logics. Though, a good layman book on that is "The Engineer and the Logician", parts of which are fairly technical, and thus at a slightly higher level of difficulty with respect to written detail. This book h Though dated, this is a still-relevant high-level basic tour on the architecture of digital computers. It goes through the processor, memory, disk, and how computation is executed through these and other components. One big omission of detail is anything to do with circuit topology and gate-logics. Though, a good layman book on that is "The Engineer and the Logician", parts of which are fairly technical, and thus at a slightly higher level of difficulty with respect to written detail. This book has charms of its own. Early in the text, the author uses the construction and functioning of a hydraulic tube-based analogue computer, which sort of fills in for the dearth on the topic circuitry. In effect, the author seems to be making the connection between this analogue computer as a type of "system dynamic", and uses this construct as his way of characterizing computers. This choice of narrative isn't surprising since the book was written within the decade bound by the mid-1980s to the mid-90s when Chaos theory was ascendant. The author makes reference to self-organizing systems, artificial evolution, and emergence at several points in the book, especially when discussing the notion of intelligence towards the end of the text. This book would be great for someone of any age getting into computing. Perhaps read as an ancillary text in their CS101 course, or just for pleasure by someone already in the field, but who may operate at a much higher level of abstraction (software), and want to review how instruction is carried out at a more literal level. A very interesting book. As Hillis points out in the intro, anyone reading Pattern on the Stone will likely already be familiar with most of the concepts involved, but his simple, elegant description of the basics of computing is never less than fascinating. The bootstrapping through layers of abstraction is particularly well-described, and this book marks the first time that I actually understood what would make quantum computing so powerful. The only downside of this book is Hillis's random in A very interesting book. As Hillis points out in the intro, anyone reading Pattern on the Stone will likely already be familiar with most of the concepts involved, but his simple, elegant description of the basics of computing is never less than fascinating. The bootstrapping through layers of abstraction is particularly well-described, and this book marks the first time that I actually understood what would make quantum computing so powerful. A nice short book explaining generally how computers work, from things like boolean logic, to how we build up complex architectures, to more advanced topics like parallel and evolutionary computing. I read this to see if it might be something my kids could read, or could be a general explanation for various people. I think if you're interested in computers, and want an easy to read explanation of the basics of how they work and a few other topics, it's a nice short read. This book took familiar concepts and was able to explain them in terms that were not too complex. I was a bit (pleasantly) surprised by the advanced topics that it ventured into by the end and it's fun to read his perspective as we see some of these technologies becoming realized right now. Since the book was written in 1998, the age is definitely starting to show in some of the language used. This is what an intro to computer science should be. This book is for people who have just got into computing or computer-related fields. After reading this book, you'll see the world as simple as an electrical switch with on and off buttons (say 1 and 0 in bits). For instance, a light can be either on or off (1 or 0). A house is either built or unbuilt. An idea could be either developed or undeveloped. You haven't thought of them as a same thing before? Well, me neither..but we'll change this. The book will give you a deeper dig into more fascinat This book is for people who have just got into computing or computer-related fields. After reading this book, you'll see the world as simple as an electrical switch with on and off buttons (say 1 and 0 in bits). For instance, a light can be either on or off (1 or 0). A house is either built or unbuilt. An idea could be either developed or undeveloped. You haven't thought of them as a same thing before? Well, me neither..but we'll change this. I think it is a marvelous introductory book to the field of CS. It guides you to a glimpse of a number of most tempting aspects of this subject, although it is not in-depth and detailed. At least it triggered my motive to study CS for at least 4 years in the university. Our dependence on computers is hardly questionable. Email, social media, typing, and searching for information, it's hard to imagine going back to the old days. Hillis is a book about ideas. Ideas about what computers are, some processes they are involved with, and the future of what computers can be. Some of my favorite things from the book is how Hillis deconstructs what computers are. Using the simple functions - and, or, invent, he not only opens the doors to programming instructions and lang Our dependence on computers is hardly questionable. Email, social media, typing, and searching for information, it's hard to imagine going back to the old days. Some of my favorite things from the book is how Hillis deconstructs what computers are. Using the simple functions - and, or, invent, he not only opens the doors to programming instructions and languages, he gives some unique examples, a hydraulic tic-tac toe game, or creating a rock-paper-scissors game via winning strategies. After reading this, I think I should add a "logic gates" unit to my intro logic course, explaining the relevance of Boolean logic to the foundations of computer science. The opening sections of this book would be ideal for teaching undergrads that material. This also contains some anti-"What Computers Can't Do" disses if you're into that kind of thing. Provides comprehensive introduction about fundamentals in computer science. I still find this book too verbose for beginners, but concepts introduced are good starting point for further study and research. Could have been a better read if more real-life analogies and illustrations are provided for clearer explanation. fundamental abstraction, boolean, finite-state mechanism, programming, algorithms and heuristics, quantum computing, turing machine, etc. A very good book that introduces the theory behind modern computers. It does a good job of explaining the basic of Boolean logic, logic blocks, and algorithms and heuristics in an easy to understand way. If you are looking for in-depth explanations this isn't the book for you. If you want something that explains why computers work (and why they break) then this is an excellent primer. How do computers really work? That is the question this book attempts to answer. The author is the designer of the world's fastest computer, but he does succeed in explaining computers' complexity with simple analogies that can be understood by people without a scientific background. From Turing Machines to Quantum Computing by machines that learn and adapt, it is all in here! The book started off slow but the topics covered at the end of the book were interesting. I imagine that the more knowledge you have concerning these subjects, the less enjoyable and useful this book will be to you. 2.5 stars. There were times I wished I could press the author to clarify his meaning. But this is the only introduction to computer science I have read, so I'm not sure how well it compares to others. This book is basically a review of what you learn in an intro to computer science course. I gotta say I'm very impressed by how brilliantly the concepts are explained; definitely better than any textbook I've read! It's super short and definitely worth a read! Easily the best introduction I know to what computing is about. It's quite clear — I read The Pattern on the Stone around the age of 14-17 or so, and as I flip through it now with a CS degree under my belt, I can only marvel how elegantly Hillis introduces many large and complicated topics.